Note: This is a revised version of two posts that originally appeared on NeuroDojo. They are here and here. 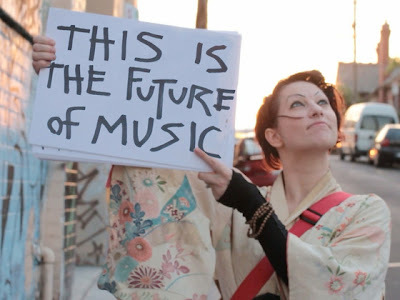 One day before SciFund started, musician Amanda Palmer started a Kickstarter campaign to fund her next record, book, and tour. She reached her goal in less than a day. As of this writing, she has raised over $600,000, more than six times her project’s target. With 22 days to go, a million dollars is not out of the question. How did she do it? By taking a long term view, and connecting with people day in, day out, for years before asking for their help. That picture resonated with me. She’s right. Because of SciFund, I’ve been watching stories on crowdfunding. And I keep reading about records being broken for amounts of money raised. Stats like crowdfunding providing more money for arts than the American government. And analyses showing how crowdfunding support is growing. I am convinced that this is not just the future of music. Danielle’s comment also resonated with me. It drove home to me how so many scientists are still in the place artists were. We’re hanging a lot on an audition. We’re waiting to be chosen. Waiting to be given permission. Working and working and working in the hope of being given a shot at the big time by someone else with more money, power, and influence. Traditionally, this has been the way science got done. Originally, men of letters sought out patrons. In the Victoria era, science was the domain of the wealthy. As science became professionalized in the last century, grant agencies became talent scouts, trying to guess who would be successful in the future. It doesn’t always have to be that way now. It’s just matter of time before some researcher breaks through with a massive science crowdfunding project. It probably won’t be me, but that doesn’t matter. We saw a hint of it in Round 1 of SciFund, with the success of the “Killer Ks”, Kristina Killgrove and Kelly Weinersmith. Looking at the SciFund projects in both rounds, it seems there is a niche for projects that would be difficult to get running through more traditional funding mechanisms, but that might be able to thrive on crowdfunding. For example, Matt Shipman provides a great example of how hard it is to get funding to do research on bed bugs. Skeptical posts about crowdfunding for science appeared on Oikos Blog and Culture of Science. Jamie Vernon and I had an interesting exchange on Twitter on this subject. Now, I understand the skepticism if you’re just thinking about crowdfunding for the first time. I realized I’ve been slowly developing arguments for crowdfunding for years on my blog. Here’s a short summary of the main points I’ve made about over the last five (!) years, with links to my older posts. Scientific funding in many nations have become extremely dependent on external funding, mainly federal governments. Competition for these grants have gotten ferocious. We have to face the very real possibility that rates of federal funding are not going to go back up; at least, not in the short term, and not by the amount scientists think would be sustainable. Even if industry still had skin in the game (not as much as they used to), there are legitimate concerns with industry funding of science. The track record of dealing with conflicts of interest arising from industry money is… not good. Given those conditions, those who have been successful at establishing research (the tier one research universities) are going to fight like hell to make sure they continue to get most of that money. Consequently, there could be a Balkanization of research, with certain kinds of institutions and research being disparaged as “low quality,” which effectively squeezes them out of the picture and prevents them from making scholarly contributions. There’s a lot of damn good science that is cheap and possible right now. It doesn’t need new theories, conceptual breakthrough, or new technologies. It just needs “boots on the ground” and a little money to grease the wheels. As a result, we need new funding models, particularly for “small science” (a less than ideal term, but will do for now). All of this sets the stage for why crowdfunding is going to be part of the future of science. The qualifier’s important (though not so important as to put on an inspirational sign). I don’t think it can replace traditional science funding, nor should it. 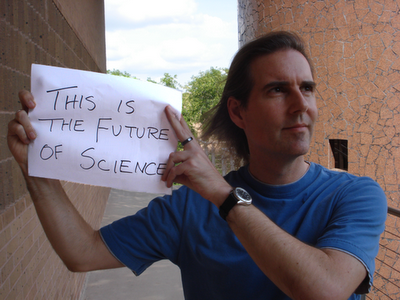 The future of science is starting now. Be part of something great. Hi Zen, great post! Another encouraging entry on science-funding! Let´s get things done! I am just reading this now. It is great. I think one other thing that crowd-funding does is allow more room for projects that challenge established norms. Giving them seed money so that they can then grow.